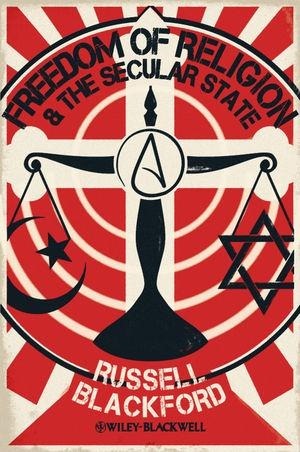 Freedom of Religion & The Secular State, by Russell Blackford. Publisher: John Wiley and Sons. Philosopher and self-styled whipping boy, Michael Ruse, once described Russell Blackford as a ‘Junior New Atheist from Australia’. Ruse fancies himself, amongst other things, as a veteran of secular court battles, and an opener of dialogue between believer and non. Good for him. I’m not sure, however, that Ruse is being wise in dismissing Blackford. Blackford starts from a tolerant Lockean basis for the separation of church and state, justifying this in a historical context, and comparing it to competing theories, before moving forward to argue how in essence, the Lockean treatment is still applicable to modern disputes. Anyone familiar with Blackford’s small-l liberal leanings, will not be surprised by his arguing against burqa bans, while those looking for black-and-white posturing will be disappointed; Blackford doesn’t deny there are situations where secular contractual obligations may reasonably require, say an employee, not to wear the burqa in a certain space. Similarly, against ‘New Atheist’ type, Blackford doesn’t treat the religious establishment’s arguments with categorical derision, notionally agreeing that defensible arguments can be made to indefinitely postpone various secular reforms. This especially where the social costs of reform could exceed the benefits of implementing them. Of course, there are various religious privileges that don’t fall into this category, and it is here, after consideration, that Blackford takes a stronger stance. The idea that Catholics can’t become a head of state, in any modern democracy (or for that matter, any modern soft-theocracy), and ridiculous orthodox notions like these, are given the (admittedly polite) rebuke they rightly deserve. (Malcolm Turnbull, and an Australian Republic, appear in-mind whenever I encounter issues like these in Blackford’s work). The book is incredibly concise. It doesn’t tarry, taking time to make quips – the necessary technical detail is raised, and in a manner amenable to us laypersons. Again, against ‘New Atheist’ type, Blackford’s effort isn’t remotely populist, at least in as far as populism is a negative – it’s intellectualism accessible to members of the lumpenproletariat such as yours truly (making it a valuable addition to any public library). Only the most precious could find the tome objectionable. Blackford for example, doesn’t outright dismiss the possibility of justifiable persecution of religion X, by a hypothetical secular state. Those with persecution complexes will perhaps convince themselves, ‘he means me’, whereas more sensible readers will think more along the lines of ‘sarin-gas-death-cult’. In being concise, the reader isn’t treated like a dolt – ridiculous interpretations aren’t endlessly qualified against, and this does at some points leave the text open to spurious readings. No doubt at some point, somewhere, a close-reading paranoid, working away in their bunker, will uncover in Blackford’s little tome, the kernel of a ‘New Atheist’ conspiracy to enslave the religious, and crush human flourishing. Most of us however, should be able to sleep soundly, all the more for not having had our time wasted or our intelligence insulted. I’m left wondering, because I’ve never seen anything like it, how Michael Ruse has made a contribution to the secular public debate at anything approaching this quality. Correct me if I’m ignorant. More importantly, the Australian discourse on secularism seems wanting. The history of debate surrounding the issue of federally funded school chaplains, erecting their ministries (under a different name) in public schools, seems impoverished after reading Freedom of Religion & The Secular State. I’m left wanting yet again better justifications from politicians, and much more challenging counter-arguments from the beneficiaries of the current arrangement. It’s not just that I think people have been wrong, I think the debate has suffered from low expectations – the media has been especially compliant in allowing tripe pass as informed comment. Freedom of Religion & The Secular State will raise your expectations. This shortfall in discussions of secularism is framed against a bleak political backdrop; Lindsay Tanner’s Sideshow, and George Megalogenis’ essay, Trivial Pursuit, can meaningfully lament the dumbing-down and privileged insularity of Australian politics of the age, without resorting to populism, all with the general approval of political wonks. For its part of the broader political debate, Blackford’s treatment of the secular state is met with a needing polity. I doubt that this is significantly less true in most other modern democracies. I want for people to read this important book. I want the Greens to read it. I want the major parties to read it. I want Bob Carr to read it it to see if he thinks it could be a worthwhile subject of discussion in the training of Young Labor members. I want to see the moderates in the Young Liberals to read it to see how it could inform their politics. I want unionists to read it to see how their views on workplace discrimination are influenced. I want secular Jains, Jews, Muslims, Catholics, Anglicans, Unitarians, Buddhists, and all the other colours of the theist rainbow, to read it. Note: For those free in Melbourne, this Thursday night, the 12th of April at 6:30pm, Russell Blackford will be appearing at Embiggen Books with Meredith Doig and Graham Oppy to discuss how Australia can move forward as a secular nation. Secularists of all stripes are welcome – theist or non – and I’m planning to be in attendance myself, which means I’d better get back to packing! Posted on April 10, 2012 by Bruce EverettPosted in Books, Politics, Religious Tolerance, SecularismTagged Book Reviews, Freedom of Religion & The Secular State. Oh if you insist Bruce. That’s Alom and Russell’s book I will have to pick up from Embiggen. “indefinably” — do you mean “indefinitely”? “polity” is a noun, and I don’t think is the word you mean. Having said that, I’m not clear what is. Cheers Jonathan. I’d made a typo with ‘indefinitely’, which I recall making, and when using the pop-down spell-check (which I also remember), I clearly clicked on the wrong word (which I didn’t realise until you brought my attention to it). Again, cheers for that. This writing and travelling thing is a new mix to me! My use of the word ‘polity’ is rhetorical, although I use it basically as a substitute for ‘civil society’ – a society, at least in Australia, which is lacking in sensible political discussion. (My use of ‘lumpenproletariat’ is also used somewhat rhetorically – my possession of a science degree probably disqualifies me from membership, technically, although it’s a bit of an archaic term probably in need of being revised).